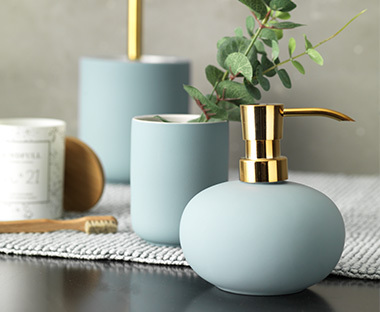 For the best bathroom decor, you can be sure to find great styles at JYSK. 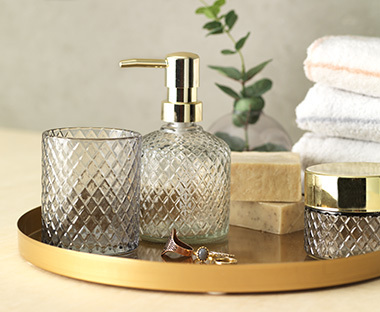 Online and in stores you’ll find everything you need to make your bathroom comfortable and stylish. 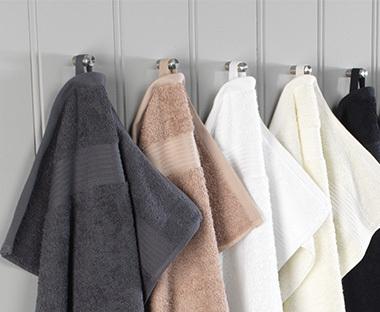 Our towels come in a wide range of colours, fabrics and sizes; you can fit out your bathroom with shower curtains, bath mats and more – all in one place, and all at an affordable price! The bathroom may well be considered by many to be the smallest room, but does that mean any less thought should go into how it looks and feels? JYSK thinks that this is a question that does not deserve being answered. Most of our towels are certified with the OEKO-TEX Standard 100 label, which is the world's leading health eco-label for textiles. The marked items are tested for chemicals and dyes that may be harmful to your health and checked by bodies including the Danish Technological Institute, IFP Research, the Hohenstein Research Institute, Shirley Technologies and TESTEX. Because of this we can absolutely confirm that cuddling up in one of our towels IS good for you and your pocket! Check out the fantastic range and take a look at our bathroom blogs for bathroom decor ideas.